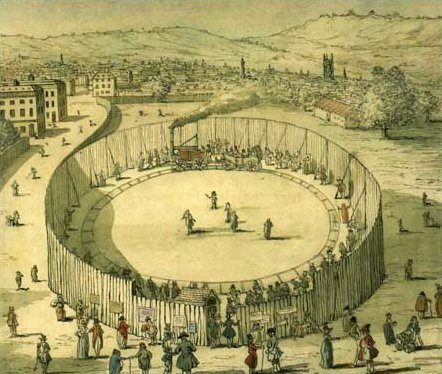 Trevithick’s steam circus on which ran the locomotive "Catch me who can". 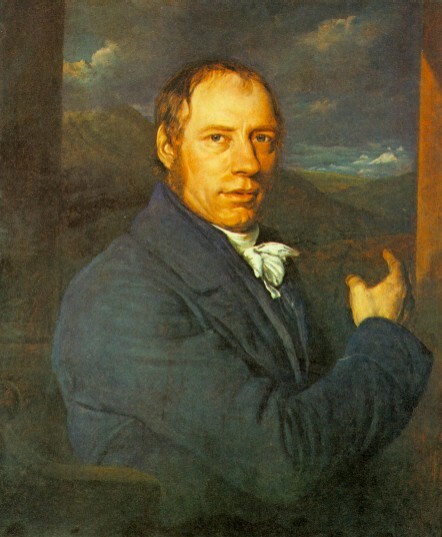 There is evidence that this "illustration" is not contemporary but was made long after the event. From a contemporary illustration (1808). Recent archaeological evidence indicates that the event took place on a site in Bloomsbury, London, now underneath the Chadwick Building, University College London. This is off Gower Street, (opposite University Street, previously Carmarthen Street). 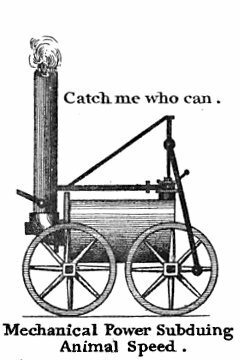 Catch Me Who Can was the fourth and last steam railway locomotive created by Richard Trevithick, after those at Coalbrookdale, Penydarren ironworks and Wylam colliery. Built in 1808 by Rastrick and Hazledine at their foundry in Bridgnorth, England. It was demonstrated to the public at a "steam circus" organized by Trevithick on a circular track in Bloomsbury.